'I Feel Good': Final Parkland Shooting Survivor Released From Hospital : The Two-Way Teen Anthony Borges was among the most seriously injured after being shot five times. His family is preparing to sue Broward County officials for not doing more "to prevent this tragedy." Sheriff Scott Israel, holds the hand of Anthony Borges, 15, a student at Marjory Stoneman Douglas High School in a photo released Feb. 18. Anthony was the last Parkland survivor to be released from the hospital and now his lawyer is preparing a lawsuit against the Sheriff's Office and others in connection with the shooting. Seven weeks after a gunman opened fire on Marjory Stoneman Douglas High School in Parkland, Fla., wounding 17 people and killing 17 others, the last survivor has been released from the hospital and is recovering at home. 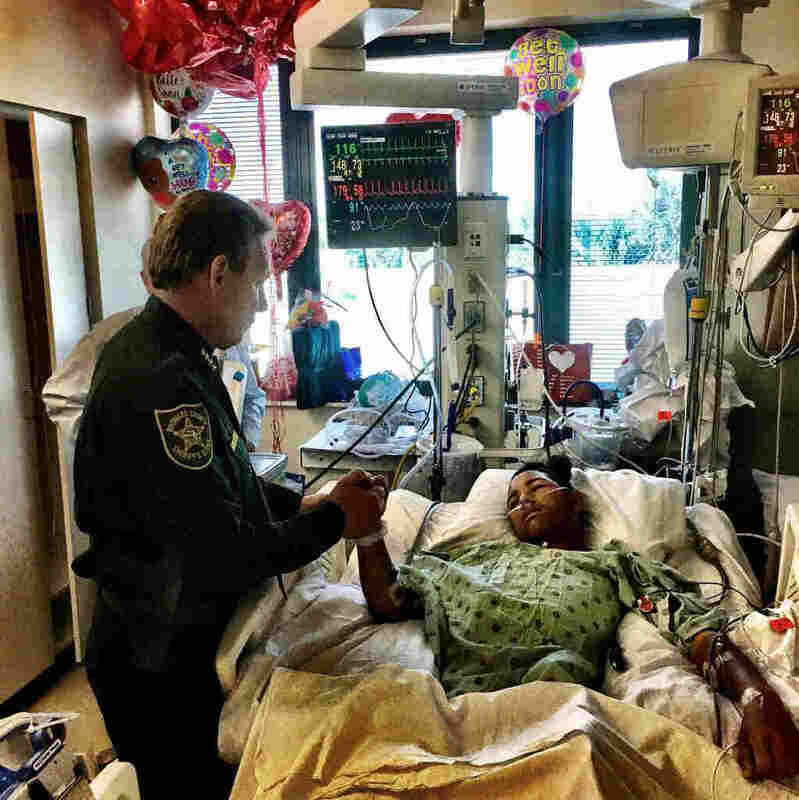 Broward Health Medical Center treated all of the wounded from the Feb. 14 massacre and confirmed to NPR that 15-year-old Anthony Borges was the final patient to be discharged. Anthony was also among the most gravely injured. He was shot five times, one bullet shattering his thigh bone and another piercing his back, according to his GoFundMe page. He has undergone nine surgeries and had a third of his lung removed, according to NBC News. He was in "a lot of pain," his father said on Facebook. He recounted that his son endured one surgery to place a plate in his femur and another to ward off infection in his abdomen. "This kid is an athlete, and he's obviously in very good shape," Borges' lawyer Alex Arreaza told The Sun-Sentinal in early March. "He has grit and is super tough." Anthony has also been hailed a hero and credited with saving the lives of several others after he reportedly attempted to close and lock a door during the shooting with about 20 students inside. Anthony was shot through the door, reports CNN. Arreaza told The Miami Herald that Anthony, a Boy Scout, managed to use his training to create a tourniquet and stop the bleeding. "I feel good," Anthony told NBC News on Wednesday, from his bed at home where he continues his recovery, even though at one point, Anthony said, he thought he "was going to die." Now his lawyer, Arreaza, is preparing a lawsuit against Broward County, Broward County Public Schools and the county sheriff's office, reports CNN. "The failure of Broward County Public Schools, and of the Principal and School Resource Officer to adequately protect students, and in particular our client, from life-threatening harm were unreasonable, callous and negligent," Arreaza wrote in a notice of intent to sue. He told The Miami Herald "there could have been a lot more done to prevent this tragedy." "Due to his condition, Mr. Borges is currently unable to walk and has a great deal of difficulty performing rudimentary tasks for himself, requiring assistance constantly," Arreaza said in the letter, according to the Herald. "Unfortunately medical bills can bankrupt a family and it has to be addressed." In the meantime, well-wishers are pitching in. Anthony's GoFundMe page has raised more than $800,000 toward a $1 million goal. "He has a long road of recovery ahead of him," the page says. At least one other family is also preparing to sue. The Herald reports the law firm representing Kyle Laman, a 15-year-old student shot in the attack, has sent a notification letter of its intent to sue to the Broward County Sheriff's Office, the FBI, the Broward School Board and other defendants. The Sheriff's Office has come under intense criticism for the way it handled multiple complaints about the alleged gunman in the years prior to the attack.